Boilsoft Screen Recorder(http://www.boilsoft.com/screenrecorder/index.html) is a powerful yet elegant screen-recording software that can help you capture and record and the screen activities into AVI or WMV files. 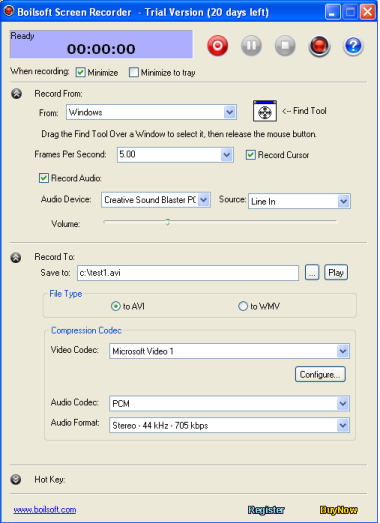 You can even record audio into the video file from any sources, including the microphone, line-in, or speakers. 1 Capture and record video from full screen, windows, region or a fixed region. 2 Video Codec, Bitrate, Audio Codec or Audio format the recorded video will contain can be full customized as you like. 3 Output to AVI file. You can choose the video compressor, and its compression quality. Supports DivX, XviD. 4 Previewing the record video is supported. 5 Supports recording to WMV file, all the video setting and audio setting can be configured. 6 Support recording mouse cursor on screen. 7 Support recording audio from any sources including the microphone, line-in, or speakers.